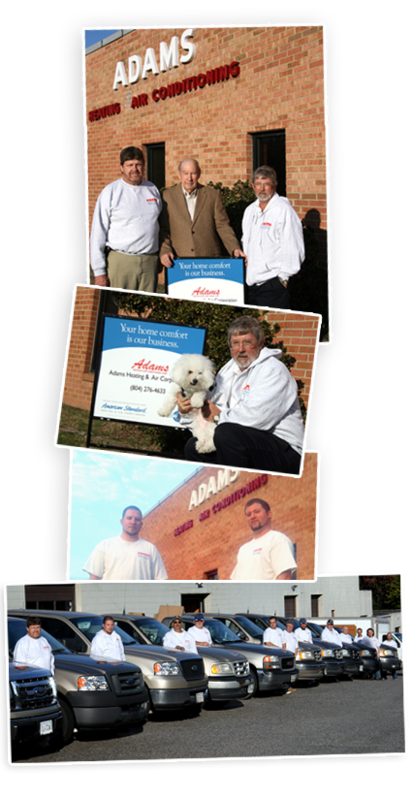 Adams Heating and Air Conditioning, Corp. is a full service heating, air conditioning and indoor air quality company serving the central Virginia area. Bob and Betty Adams opened the doors in 1963 and we continue today to be a family-owned and operated business with Bobby and Linda Adams, and 3rd generation Wayland and Jordan Adams. Last but not least, our newest employee "Sadie".... our Bichon Frise puppy who is ready to greet you if you decide to drop by our office located at 5770 Hu11 Street Road. As an American Standard Customer Care Dealer we are proud to carry a complete line of high efficiency gas furnaces, heat pumps, air conditioners and indoor air quality products. Our technicians, installers and sales staff (which are full-time employees, not subcontractors), are factory trained and ready to make your home or office as efficient and as comfortable as possible. Adams Heating has a complete metal duct fabrication shop that is prepared to meet any custom install that you may have. Adams Heating & Air Conditioning started as a Fuel Oil Company in 1963, but soon partnered with General Electric as one of the first companies to offer heat pumps in the Richmond area. General Electric was bought by the Trane Company and Adams heating continued to install Trane products, eventually becoming the largest volume Trane Dealer thru 2007. In 2007, we joined the American Standard family, which is the sister company to Trane, and we have been the highest volume American Standard dealer each year since 2007. Our team leaders, Jimmy Norby, David Parrett and Michael Inge, lead our family of employees to take care of all your heating and cooling needs, and are ready to visit you today for a free estimate. Please feel free to visit our Payment Options page to fill out our online financing application and get prequalified today. If your system requires service, please call our office to schedule an appointment for our service personnel to visit your home or office. Bobby and Linda Adams... and, Sadie.